You schlep your garments to laundry to dry-clean them. It requires you drive to the laundry, wait in the long queues to drop the clothes, and even inhale some nasty chemicals. This is both time taking and tiresome. 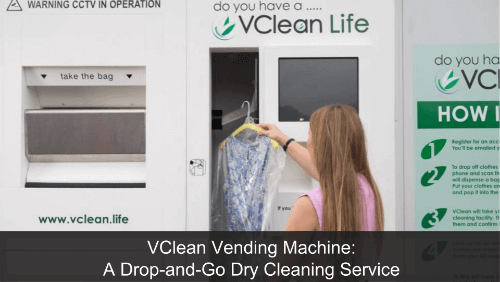 The good news is that now you can simply drop your clothes at a VClean Vending Machine for dry cleaning while you’re enroute to your office. And you can pick them back the next day. VClean Vending Machines are making it possible at London, UK. VClean is the UK’s largest fully wet clean company. Their aim is a cleaner and greener future. They’ve been cleaning clothes for corporates since four years. Now they’ve come up to offer their services to the public. VClean has partnered with ‘Transport for London’ to place the VClean Vending Machines across the network stations in London. About 200 such VClean units will go live in next few months across London. Mr Harris even plans to put up more such VDrop stations across the UK in future. This is one way how the UK is using QR Codes. Just like London, cities across the world are taking steps to make citizens’ lives better. That’s all you need to know about London’s VClean Vending machine.